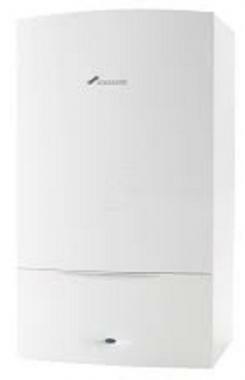 The Greenstar 30i is a wall mounted system gas boiler by Worcester Bosch. It is a highly efficient boiler, coming in the output of 30kW and having an efficiency rating of 92%. It is the perfect model for small or medium sized homes, and is also compatible with the Greenstore cylinders by Worcester Bosch. The Greenstar comes with many advantages such as easy to use controls as well as a wide range of control choices, helping you to use the boiler to its full advantage and ensuring you are more comfortable in your home. It boasts a display with information that is clear and easy to read. This is a suitable boiler for homes where the heating system includes a hot water storage cylinder. This unit also comes with a low energy pump, helping to reduce the electrical usage. It also comes equipped with a large condensesure style siphon built into the boiler to protect it from any sort of frost risk. The Greenstar comes with 5 years warranty to give you that added element of security.